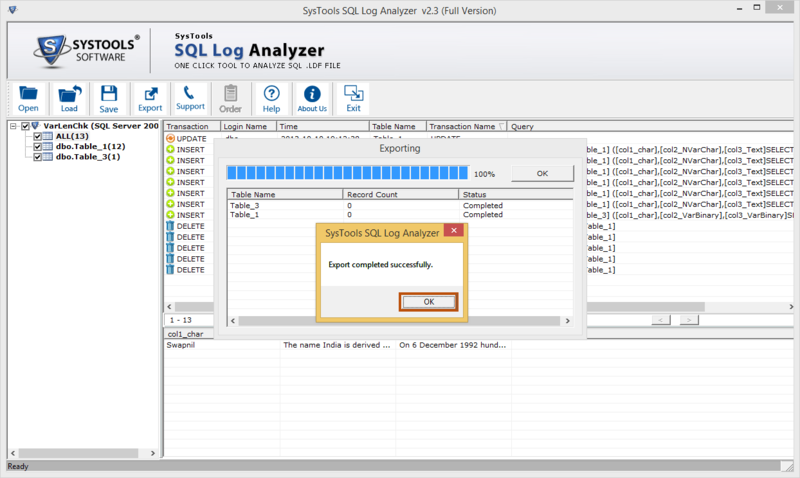 SQL log analyzer process lets you view SQL database transaction logs like insert, update & delete as well as SQL queries that were executed on your database. 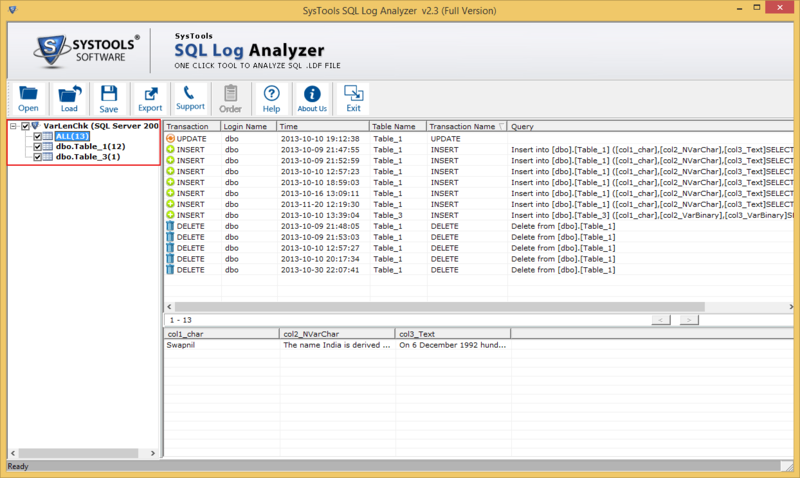 SQL log reader tool has an interactive GUI which makes the transaction log reading process easy for the users. Preview database activities: Transaction, Login Name, Time, Table Name, Query. 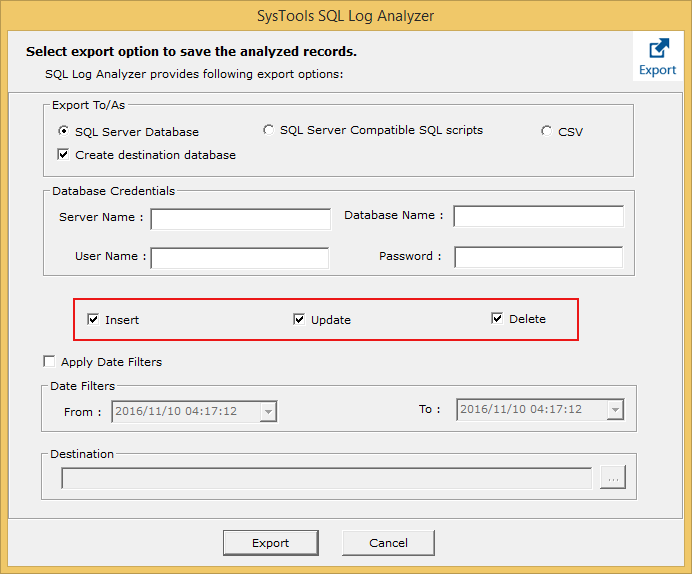 Analyze SQL Transaction Logs: Insert, Update, Delete etc. 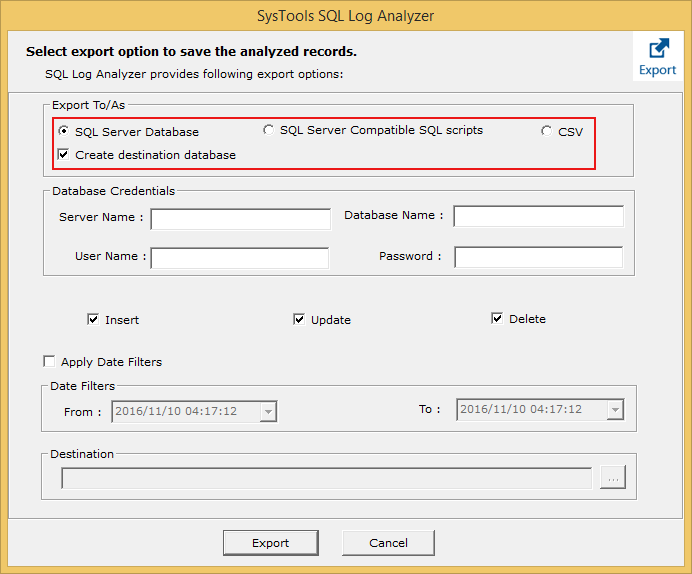 Export Database into: SQL Database, CSV file & SQL Server Compatible Script. Support .ldf File of SQL Server: 2017, 2016, 2014, 2012, 2008 and 2005 versions. 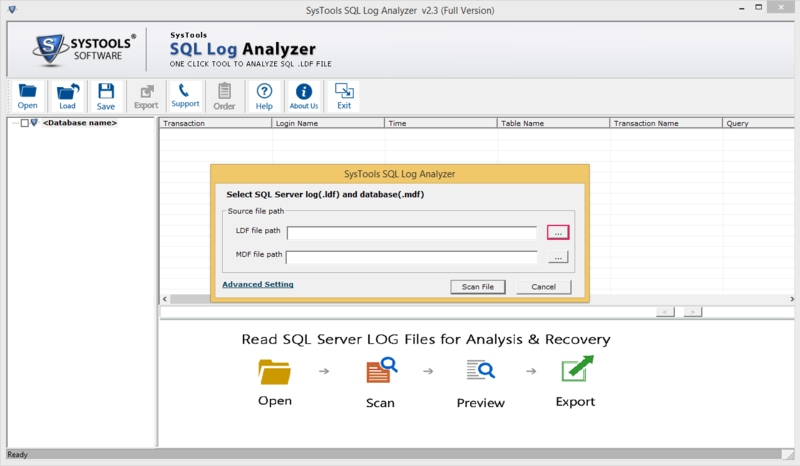 SQL log analyzer allow you to open and read SQL Server transaction log file without installing SQL Server in your machine. SQL log reader can show the transactions like Insert, Update, Delete with Transaction, Login Name, Time, Query etc. Once the log file with its associated .mdf file is successfully scanned by SQL Log file viewer, then the software can preview the log file information and allow you to sort the transaction details in ascending or descending order according to your choice. SQL log file reader is compatible with different SQL Server versions like 2005, 2008, 2012, 2014, 2016, 2017. Hence it can easily support the transaction log files of mentioned versions of SQL Server. As well as Software can also run on windows Xp, 7, 8, 8.1 & 10. 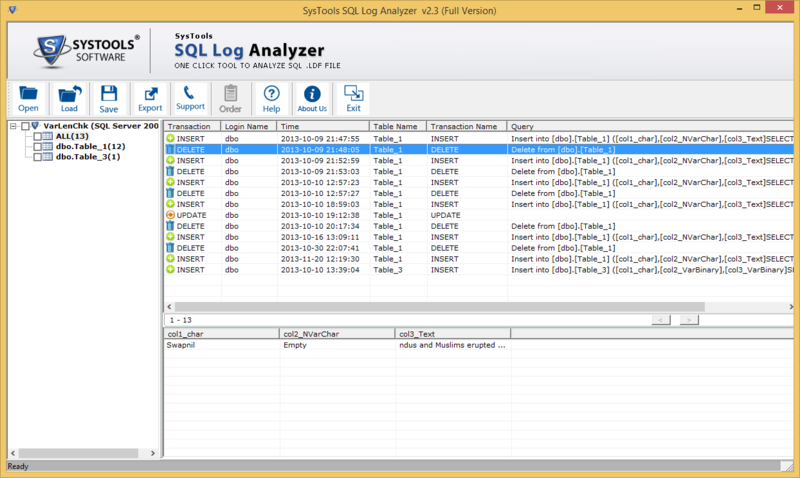 SQL transaction log reader tool not only analyzes SQL Server log file, it also performs SQL Log file recovery through database transaction logs. Once the software completely scans the log file, it recovers the transactional information of your database by exporting the database elements. SQL transaction log analyzer not only shows the deleted records of a table, it also provide you the option to recover accidentally deleted data from a table in SQL Server database and get back your mistakenly deleted records from transaction log file. 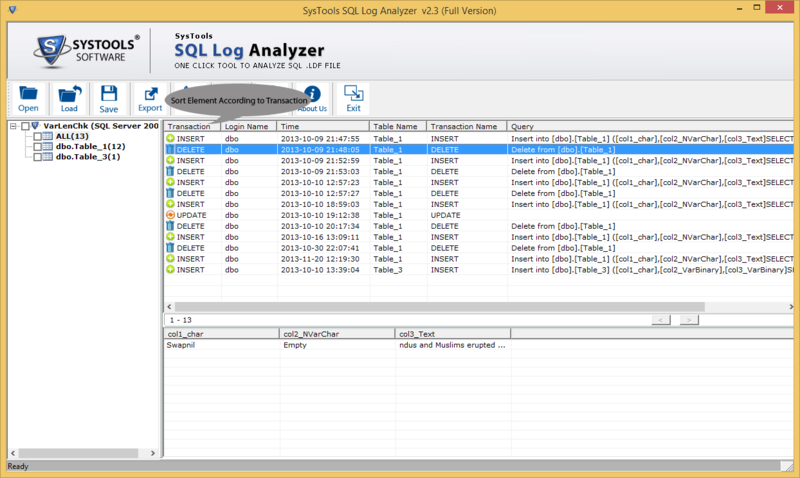 After completely analysing SQL transaction logs, SQL log file viewer allow you to select desired database items and export by check or unchecked them. This will help you in recovering a particular record from log file database. 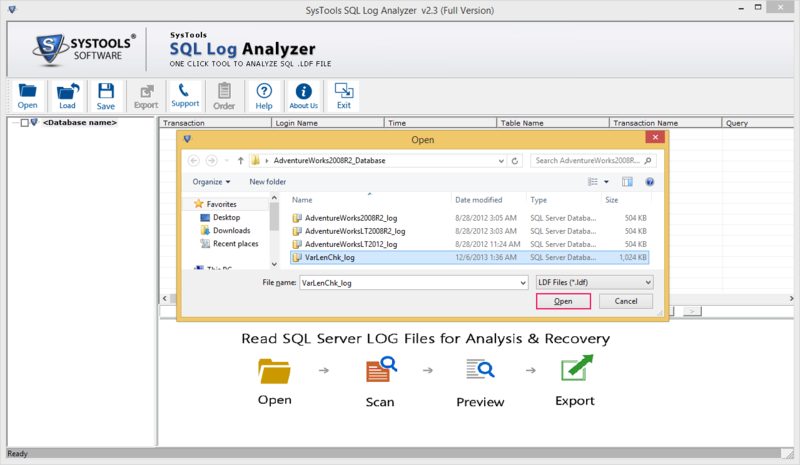 Once the log file successfully scanned by SQL Server log analyzer tool, software allow you to save the scanned detail in .str file format for later use. So the next time you don't need to re-scan the log file data. CSV: Data can also be exported as a comma seperated values. Browse .ldf File by manual select option. Select .ldf file by clicking on Open button. Also Select associated .mdf and click on Scan File. Sort database elements by Transactions, Login Name, Time, Table Name, Transaction Name & Query. Select desired database tables to Export its data. Similarly Filter transaction according to Date. Exported log file data successfully. We are professional provider of E-discovery tools like SQL Log analyzer that provides foolproof satisfaction in analyzing SQL log files transactions for SQL Server 2005 & 2008. 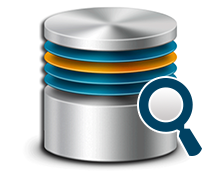 We are expert provider of SQL log file viewer and Server related services for highly specialized administrators and other individuals who deal with SQL Server database. Can I view SQL database transaction logs like Delete, Insert, Update using this tool? Yes, SQL log file viewer is able to view such transactions performed on a database. Does this transaction log reader can open log file of SQL Server 2017 version? Yes, SQL transaction log analyzer is able to open and view log file of sql server 2017, 2016, 2014, 2012, 2008 & 2005 versions. 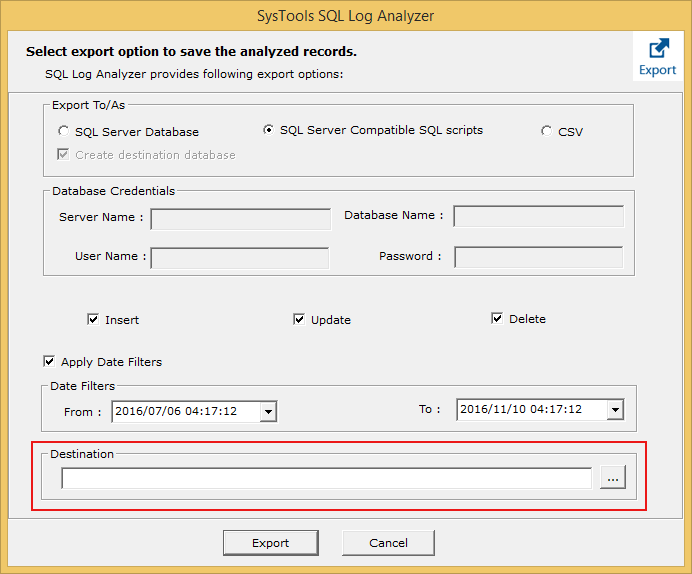 Do I need to have SQL Server Installed on my machine to open SQL transaction log file? No, To view SQL log file transactions you don't need to have SQL Server Installed on your machine. Can I use this tool to perform SQL log file forensics? Yes, as the tool supports advanced data types. So, It can also be used to perform log file forensics. 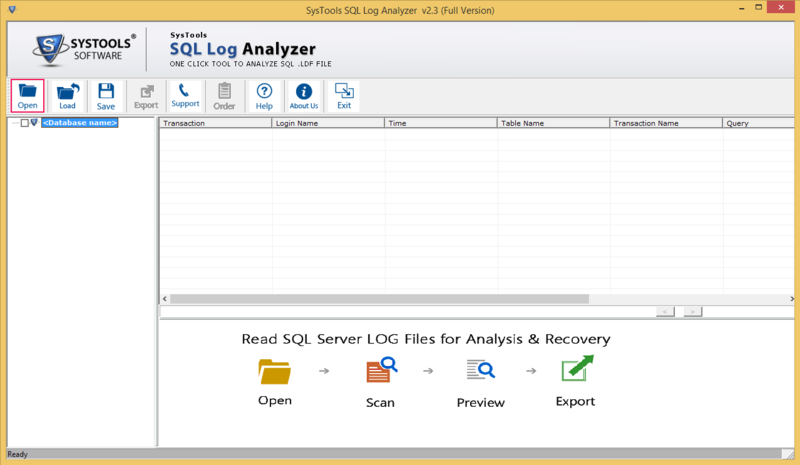 Is it possible to recover accidentally deleted records using SQL log file viewer, If the database in Simple Recovery Mode? 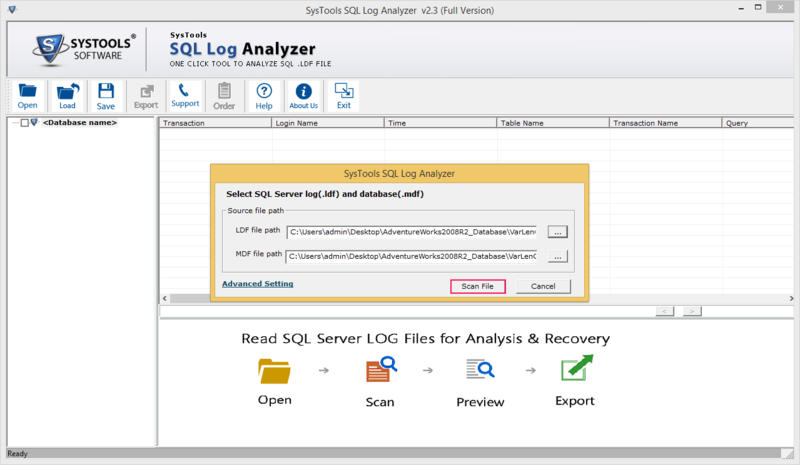 Yes, SQL transaction log recovery tool can recover accidentally deleted data from log file if the recovery model is set to Simple. I was searching for the way to view my database transactions and I have found some undocumented functions which were helpful in viewing transaction logs from SQL Server log file, but the process is too long and time consuming, then I tried this SQL log reader tool to view my log file transactions. I accidentally deleted some of my database tables records with wrong WHERE clause. After checking the table I found that I have lost a huge amount of data, and unfortunately command was not performed within a transaction and no recent backup available for its recovery, after searching for the solution I got this SQL log analyzer tool helpful in recovery of that records using ldf file. I was looking forward for a reliable tool that can help exporting log transaction files to CSV files with all incorporated log details such as Insert, Delete, Update, etc. 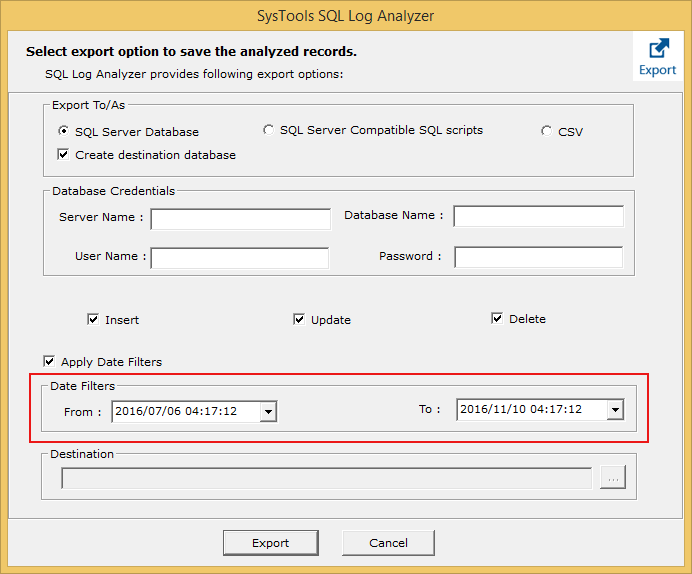 SQL Log Analyzer fulfilled the requirement and also provided the option to export log files as SQL Server Database and SQL compatible scripts with efficient performance.